EK®, the leading premium liquid cooling gear manufacturer, announces the global launch of their new high-end Quantum Product Line. It includes the roll-out of their first two top-of-the-line water block products: Velocity and Vector. EK-Velocity is the new high-performance flagship premium quality CPU water block featuring the fifth iteration of the award-winning EK cooling engine for modern Intel® and AMD® processors. The EK-Vector RTX 2000 series is the new generation of high-performance water blocks for the NVIDIA® GeForce® RTX series graphics cards, based on Turing TU104 and Turing TU102 graphics processor. 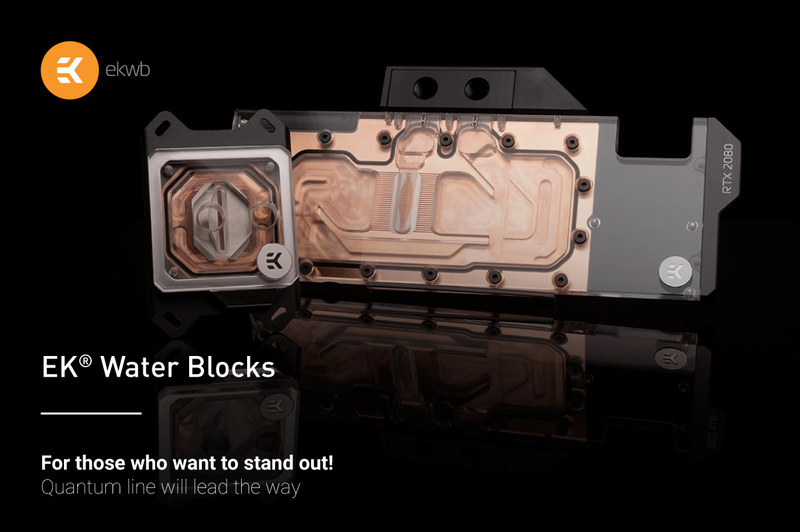 The newly developed water blocks feature a redesigned cooling engine that has a larger footprint compared to the previous generation of full cover water blocks. This results in a larger surface area for heat transfer, which allows the increase of thermal performance of these water blocks. The Quantum Product Line is now available worldwide through a network of partners and resellers, as well as directly through the EK Online Store. Headquartered in Slovenia with US headquarters in San Antonio, TX, EK has offices around the world and is the leading premium liquid cooling gear manufacturer that delivers a full line of high-end solutions through a global channel of partners, distributors and resellers in more than 30 countries worldwide.